With New York completed last week I have actually got a collection of states that runs from one ocean to the other, but to make the Eastern connection more significant I am going to look at the temperatures in Massachusetts this week. Given the number of stations that there were in New York, it is a bit of a relief to find that there are only a dozen USHCN stations in the state. There is also, according to Chiefio’s list, only one GISS station in the state, in Boston. So that should make the initial data download relatively painless. There was one snag in finding the Blue Hill Observatory, but it turns out (using Google Earth) that it is in Canton, MA, whose data I used. Having driven West from Boston in the past, I remembered that the road climbed almost all the way to the New York border. And, yet there seemed to be few stations with higher elevations, so I looked a bit more closely and there were only 2 stations in the western half of the state, and only two whose elevation was above the average. 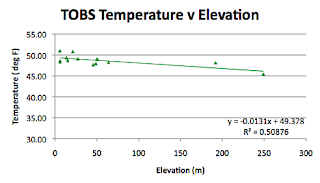 The rest of the stations had an elevation below 65 m, while the average elevation of the state is at 150 m. Given, as I will show that there is a strong negative correlation between temperature and elevation, the station locations are weighted to those closer to the sea. Having said that I am going to use the TOBS plots to show how the temperatures have varied in the state over the last 115 years, and to look at the usual suspects (Latitude etc) to see how these affect the numbers. And because I have gone from one coast to the other, I thought I would tabulate some of the data that I have been plotting. 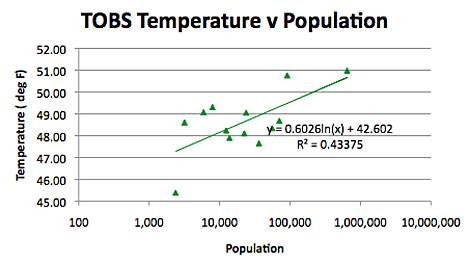 So firstly, how accurate is the GISS temperature in modeling average temperatures in the state. 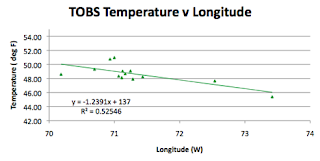 As you can see, even with the average being taken from stations at lower altitudes, reading the GISS temperature at Logan Airport in Boston, which is sensibly on the sea, gives a temperature that is, on average 2.48 degrees warmer than that average, though it is going down a little. For the state, as a whole, the temperature has been rising over the past 115 years, at a rate of around 2 deg per century. However the temperature rise seems a little steeper pre-1950 than it has been since. 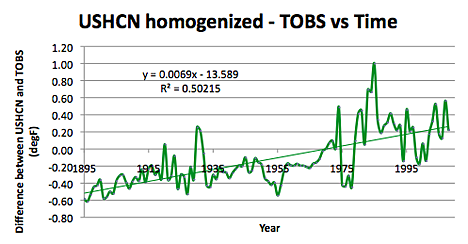 The homogenized data that the USHCN generates suggests that the temperature rise has been somewhat higher, at 2.77 deg per century, with a higher R^2 of 0.43. 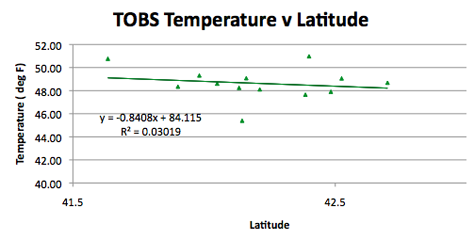 Looking at the effects of station location, the change in latitude continues to have an impact, though not nearly as significant as it has been in other states. This could, in part have been due to the two highest average station temperatures being for stations relatively close to sea-level. At the same time there are not that many stations in the state. 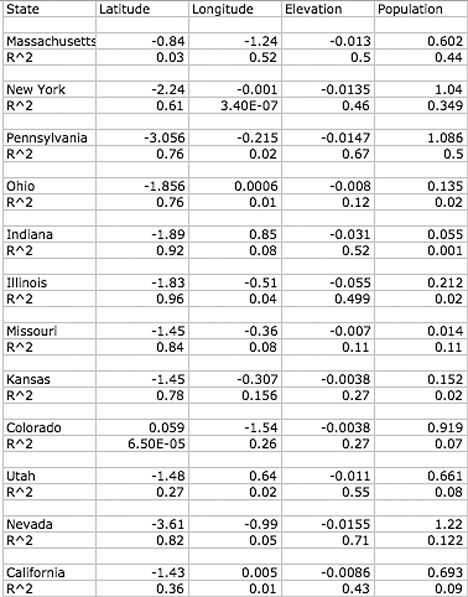 (Interestingly the homogenization improves the R^2 value in this case, to 0.122, with a higher coefficient of -1.98, which is interesting if one looks at the table toward the end of the post). 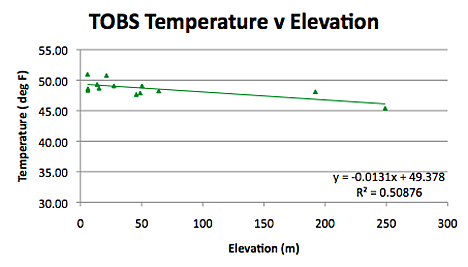 Although the correlation is quite strong, I still feel that this is more due to the other factors that just longitude, and though the correlation with elevation is not quite as good (because of the higher temperatures of the two stations down at the coast) yet that also provides much of the explanation. The homogenization of data reduces this correlation down to an R^2 of 0.33, one of the problems, I am beginning to think , of the process that they are using. 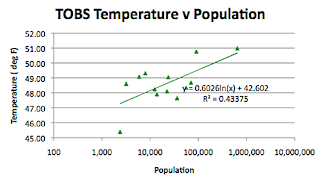 And the correlation with population continues to exist – note that the two highest temperatures are with the two largest cities. 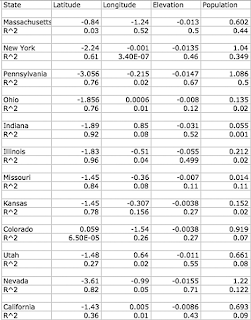 Having now examined the states from Massachusetts to California, I thought to put the coefficients (as in temp = a x property + b, and tabulating the values of “a” and the R^2 values for the different states along the line. For population values, it should be remembered that the property has been converted to a log value first. (see the figure immediately above). It can be seen that there is some consistency in the values for latitude, elevation and population, but not as consistent a set with longitude – bearing out my conjecture that there are other factors in play that influence the longitudinal correlation. 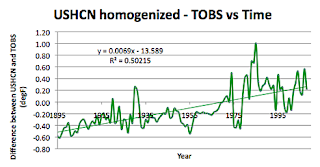 Oh, and one final thought – I did plot the difference between the homogenized data that the USHCN provides and the TOBS raw data, here it is. "For the state, as a whole, the temperature has been rising over the past 115 years, at a rate of around 2 deg per century." 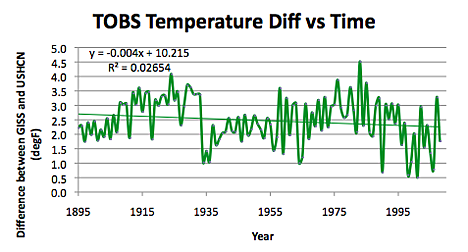 Looking at your second graph, that long-term 0.02 deg F/year increase seems to hide some different physical processes. 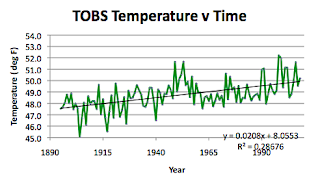 1900-1945: oscillations about a mean. 1950s: distinct jump in temperature. 1960-1990: oscillations around a lower mean. 1990s: distinct jump in temperature. 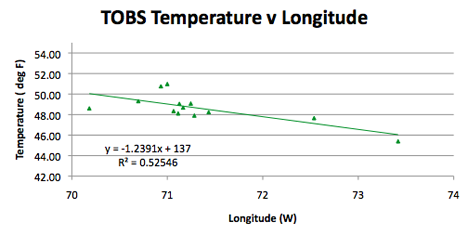 It might be interesting to calculate r-squared values for curve fits in time intervals within the TOBS data set. This might suggest that we are not seeing a steady rise in temperature. Rather, we may be seeing cyclic shifts in the latitudes at which particular wind patterns occur. I think that there is a lot of hidden information that can be teased from the numbers, but I want to get a general overview of the temperature behavior before getting into greater detail. My original interest, which only gets back in on occasion, is the question of the influence of population, with the data beginning to confirm that it is more significant than the folks at CRU and GISS would have us believe. awesome post! Thanks. You may also want to look at this website! Some good material too.